If February and March could tell a story, it would be the months of a 100 stories. Nearly. Because these last two months have been all about books. Reading the books. Discovering the books to read. Sharing the books. I didn’t get much else accomplished. Not true. I take that sentence back. And probably could have just deleted it altogether but I like to show my struggles, and recognizing the true work in the mundane is a struggle for me. These last two months have left my brain and heart a little unsteady. Unexpected previous work coming back to demand my attention (A deposition! Like Law and Order come to life! Not really. Slight exaggeration.) Future planning (Kindergarten! Already?! How?!) Current planning (It’s Lenten season in the ministry world. Hold on to your hat. We’re doing all of the things.) Many demands in a variety of directions. Moments that felt like a really bad combination of hustle and inability to control. I don’t like hustle. And I like control. So you can see why I felt a little derailed. My coping mechanism this month? Books. The stories of others. The calm and inviting words spoken through pages and pages of characters. For me it was to calm my mind before bed reading, and before anyone awakes reading, and quick they are entertained how about one more chapter reading, and I could clean the kitchen or I could read this book during naptime reading. For them it was good morning let’s all pile into bed and read this stack of books reading, and another train book reading, and another Fancy Nancy book reading, and can I watch a show, NO? ok, fine will you read me a book reading, and PLEASE will you read me this train/Fancy Nancy book just ONE more time reading. Because within those words and those characters, there are stories for all of us. Messages to carry in our hearts, lessons to write in permanent marker on the cracks of our brain, heroes to call upon in the moments in our lives that feel anxious and unpredictable. Or at the very least, it is a great story to take us away for just a moment. I don’t believe escape is running away from our lives. I believe it gives us a chance to step away from the chaos and let the dust settle a bit. Let a book carry you more gently off to sleep. It always looks better in the morning. At this time I want to share the books I read for me, and then I’ll share the books for the kids in a later post. I just can’t limit myself this go round. 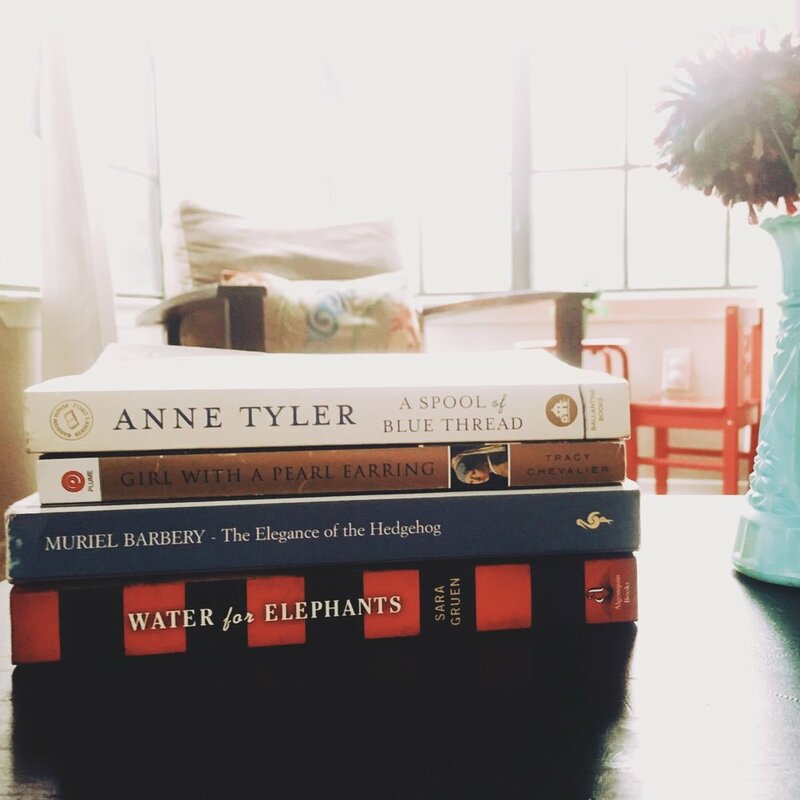 I challenged myself to read one book off my own shelf in February. I polled the audience, but I think I knew I needed to begin with this one. It was given to me by my Aunt a few years book with the introduction of one of the best books she ever read. I have started it and put it down a number of times because the writing is thick, as if written in another time but actually a current novel. I was determined to finish it this time, especially because I knew many people had mentioned not getting through it and I didn’t want to be one of those people. When I found myself struggling to read it at night, I decided to switch to audio. This was such a good lesson in learning that if a book isn't catching me in paper, if I really want to give it a go, I should try if listening to the words help bring the story to life. In this case, I’m so glad I did. The story is told from the perspective of two different people, a snarky and secretly well-read middle aged widow working as a concierge in a fancy apartment in Paris contrasted to a precocious twelve year old girl living in that apartment, who has decided she is over the mediocrity of the people in her world and will end her life on her thirteenth birthday. Because the book switches back and forth between these two narrators, hearing the book read from two different readers was so helpful. And there were pieces of writing that took my breath away. You know that feeling when you are watching a musical and the climax of a song is so powerful and beautifully sung that it just brings you to instant tears? (Just me?) That is what I found about passages in this book. I would suddenly find myself caught in a choke of tears by the elegantly crafted prose. And then the next moment there would be a snarky comment that would make me chuckle. The writing in this book was enough to keep me going and wanting more. I now think I want to go back and reread the words so I can highlight the lines that caught my breath. Please give this one a try. Do the audio. You will be so glad you did. Better yet, pick it for book club if you can convince your group to try something a little bit challenging. Quite the shift in topics, this next book was so much fun to read. If you like the era of Great Gatsby, and you like the narrator shifts and intertwining stories of Liane Moriarty, and you like a good mystery and you love strong female characters, than pick up this book. Such a fun and quick read for me. Basically a man goes missing and the story is told from three different women in his life and how their stories entangle. There was a plot twist, and I love a good plot twist. Speaking of plot twists, this book has one as well. You think you know what the book is about from the first page, a little boy is hit by a car. A mother escapes her life to grieve the horrible accident. But there is so much more to this book. I thought the death of a little boy might be too much to handle as a mom. It wasn’t because there are other deeper levels to unpack, so don’t let that scare you away. I read this one in about a 24 hour period. I went out to go shopping (Target alone! The greatest luxury for a mom!) and meet a friend for drinks I ended up sitting in my car in the parking lot of Target for almost 2 hours because I couldn’t put it down, then finished it late into the night. Can’t recommend it enough. Can someone please read this so we can talk about it? I think I might recommend it to my book club for that very reason. Another can’t put down fiction book for me because I needed to know what happened. Essentially the story takes place in the span of one dinner between two couples. You find out as the story progresses that something happened with each of their children and they are attempting to help resolve this issue. But within that there is some fantastic character psychosis outlined as well as the struggling idea about what parents might do to save the reputation of their child. As I started to describe it more to Mike it sounded weird and creepy. But really, it’s very well done, sarcastic in many ways, and left me wanting to talk about it. So read it and let’s chat! P.S. As I was linking this book to Amazon I discovered there is a movie of the book available in Prime. That might be on my weekend list. This book is all over the place for productivity and business readers alike so I won’t go into too much description. Check this post out for more details. I finished it after Mike, and I think I liked it more than he did. He thought it was repetitive and not anything he hadn’t heard before. I felt that even in my non-business world I could take the important parts into my own personal life. 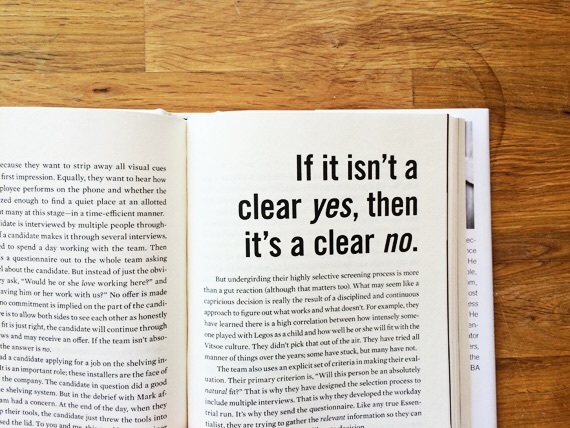 This was a library read but I think I want to buy my own copy so I can reference it often when I need reminders about how to say no. This was a very random find that I heard mention in passing on a podcast and then happened to see on the end cap at the library. A very quick read about a women who spent a whole year making little felt gnomes every single day. I love creative challenges like this and her insights were fun, especially when you learn she did this amidst probably one of the busiest times of her life, between moving and solo parenting for a few months. Reminders that creativity doesn’t have to be big, and sometimes it can save us in the midst of chaos. There were a few others read throughout these two months but I want to save them for their own posts. You can check out all of my reads from 2017 in my Goodreads account. 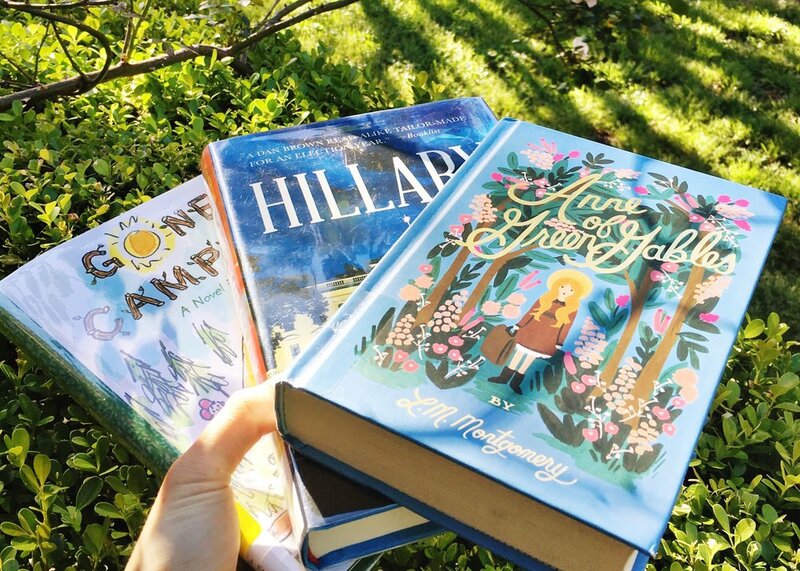 I have a whole list of various book themed posts such as what the kids have me reading, where I get my book recommendations, Little Free Libraries and more. If I can get my act together I just might make next week book week. Happy Weekend and Happy Reading! Tell me, what is on your night stand lately?